PICTOU, N.S. -- The picturesque harbour town of Pictou, N.S., has had an uneasy relationship with its job-rich, toxin-spewing neighbour almost since it opened in 1967. Now, the Northern Pulp mill is facing a possibly existential challenge over the massive amounts of effluent it casts off each day. After years of pumping 70 million litres of treated wastewater a day into lagoons on the edge of the Pictou Landing First Nation reserve, Northern Pulp wants to pipe it into the nearby Northumberland Strait. The pulp mill -- a key engine of employment in northeastern Nova Scotia and vital to the local forestry sector -- says no pipe means no mill. But some properties in the town are sprinkled with "No Pulp Waste In Our Water" signs, an indication of increasing impatience with Northern Pulp and its spotty environmental record under a succession of owners. "This has really created tension ... and it's split some families and friends," said Karla MacFarlane, a Pictou resident who is the local MLA and interim leader of the provincial Progressive Conservatives. Under provincial legislation, the mill has until 2020 to replace its current wastewater treatment plant in Boat Harbour. The wastewater lagoons contain nearly 50 years worth of toxic waste that provincial Environment Minister Iain Rankin has called one of the worst cases of environmental racism in the province, and possibly Canada. It has been a major concern for the local Mi'kmaq community, which launched a lawsuit in 2010 seeking to eject the treatment plant from its land. The band later erected a blockade to protest a leak in a pipe carrying toxic mill wastewater to the treatment plant in June 2014. The Liberal government promised to clean up the site, which led to legislation passed in 2015. At the time, Chief Andrea Paul said she was encouraged by the government's commitment to Pictou Landing and "to the greater community." In a recent interview, Paul said she was still optimistic the cleanup of the treatment lagoons -- estimated at more than $133 million so far -- would proceed as promised. But Paul said her community shares concerns expressed by fishermen around the Northumberland Strait region about a potential effluent pipe. She said residents wonder how a half-century of mill operations might have affected their health and the environment, and there is a lack of trust because of a belief that "the mill has definitely gotten away with a lot of things." "Past governments have allowed it to happen because industry is important in our province," Paul said. "I would like to see a solution that works for everyone because the last thing I want is for people to be out of work, but we also can't jeopardize a huge fishing industry either." It's a sentiment shared by MacFarlane, who admits to being torn -- her father and many relatives have worked either directly or indirectly for the mill, and it currently employs more than 300 people. Her views began to change when she returned to Pictou after living away for most of her 20s. The mill's strong sulphur odours and air emissions were omnipresent. She said the smell permeated her waterfront retail outlet, the Ship Hector Company Store, forcing her at times to offer discounts on the shirts sold there. "So no doubt we lost money because of that," said MacFarlane. "Was it an everyday occurrence? Absolutely not, but it certainly happened frequently." Northern Pulp recently completed the $36.9 million replacement project for the stack known as a precipitator. It uses static electricity to remove solid chemical particles, and critics acknowledge the work has led to a significant improvement in air quality. Still, the mill struggled with emissions and was last fall fined $700 by the province after a stack test found the particulate matter emitted exceeded limits. Premier Stephen McNeil publicly questioned whether the small fine was enough of a deterrent. The Environment Department's deputy minister has also said the mill has been the subject of 12 "actions" by the department since 2012. 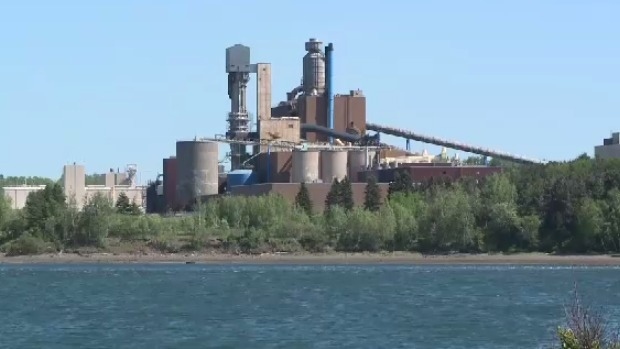 Kathy Cloutier, spokeswoman for the mill's parent company, Paper Excellence, said Northern Pulp has worked to improve its impact on the environment. "There has been in the span since 2011 to the present time a significant commitment and investment by Paper Excellence to reduce the mill's environmental footprint," said Cloutier. She said the company "acknowledges the history," but believes the new treatment plant project represents an opportunity. "We are in a position to be part of ending a legacy that is very negative and start anew with this new system and the continued commitment of Paper Excellence and Northern Pulp," said Cloutier. "The challenge is ensuring the consistency, and I think we have been working very hard to show the consistency." Cloutier said Northern Pulp will continue to engage the community, including fishermen. "We've asked them for Plan B and they said no," said Ronald Heighton, president of the Northumberland Fishermen's Association. "We told them our stance hasn't changed, there'll be no pipe in the Strait. Their comment at the time was, no pipe, no mill, and so I said I guess we are at an impasse." The company said it had thoroughly investigated the treatment options available to bleached kraft mills like Northern Pulp, which produce a higher quality paper. The mill announced its plan for a new treatment plant in December. It calls for a system that would meet all federal environmental standards for suspended solids and oxygen depletion. Effluent would be carried by polyethelyne pipe across Pictou Harbour and released through six dispersal pipes into the Strait. Cloutier said the proposed system would reduce the need for bleaching chemicals by about 30 to 40 per cent. Critics including environmental groups and Prince Edward Island Premier Wade MacLauchlan say the mill's plan could have unintended consequences for fisheries in the area. They have called for a comprehensive federal assessment along with a more comprehensive Class 2 provincial assessment, as is being done for the treatment lagoon cleanup. Pictou Mayor Jim Ryan said the town is also calling for a Class 2 assessment and the lack of one adds to the overall lack of trust in the community in the mill and its provincial overseers. Ryan said he sees it in emails and conversations with people in the community. "There tends to be an idea, or a thought out there, that the decision has already been made by Nova Scotia Environment. I'm not going to suggest that's the case, but there are people out there who are implying that for sure." Northern Pulp is to submit an environmental assessment to Nova Scotia's Environment Department sometime in July. In the meantime, MacFarlane said it appears positions are hardening, even her own. "I don't want the mill to close," she said. "But I can tell you right now I will never protect jobs over health ... or do anything damaging to our environment."